As a fabric strategist and sales representative, I often find myself digging deeper into various aspects of the fabric industry to either answer a question from a fellow quilter, student or a shop owner, or to just gain a better understanding of this field for myself. "From Field to Fabric," a presentation about cotton fabric production. My slide presentation, "From Field to Fabric," is a compilation of the research I did to address the question, "Is there a difference between "quilt-shop quality" fabric and that "stuff" from the big box stores?" After some research, an examination of the production processes, and embarking on an undercover mission to test the theory (which I tell about in my presentation), I can provide a heartfelt and resounding, "YES, there is!" 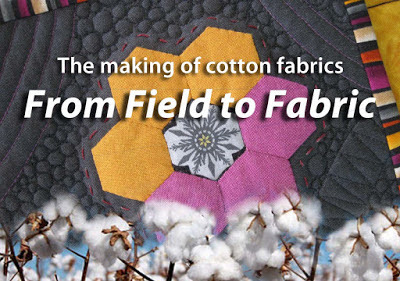 I'll be presenting "From Field to Fabric" at the Choo Choo Quilters guild meeting on Monday. The presentation covers a brief history of cotton, the fabric manufacturing processes—from weaving through printing and finishing—and I point out things that can affect quality. This weekend, I also updated the presentation to include the digitally printed fabrics that have entered the quilting market. Ever wonder how cotton fibers are magically transformed into the lovely quilting fabrics we find at the quilt shops? I'm sharing findings from my investigation at the next guild meeting. What's in your Super [Stitching] Bowl today?